De Nihilo Nihil: Mea culpa! 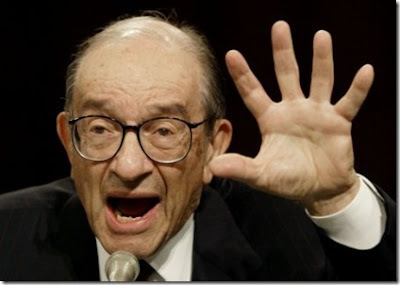 So, today, Alan Greenspan realizes that the economic theory that has guided his life for forty years—and that he used to run the monetary policy of the United States—rests on incorrect assumptions. Apparently, overseeing the internet bubble didn't help him see it or prevent him from beginning the housing bubble as a way to help us out of that one. I never understood why he was highly regarded when he was in office—I suppose it was the way he nurtured the image of the incomprehensible mandarin, with his mysterious mutterings that made us all think he must really be smarter than the economists who could actually make themselves understood or perhaps his long-ago associations with Ayn Rand—but I don't think he gains any merit for figuring out now that he helped screw everything up. He's done us no good; it's time for him to shut up.